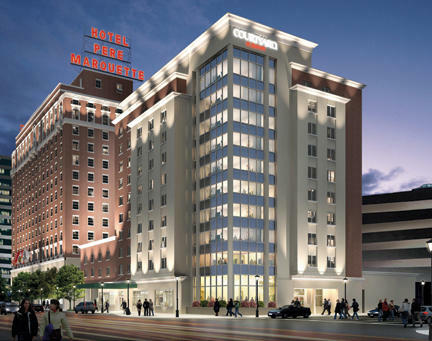 Action by the Peoria City Council last night will help keep the Hotel Pere Marquette open. Hotel owner Gary Matthews is behind in paying his lenders, which includes the city of Peoria. The council approved a special service area (SSA) allowing the hotel to charge an additional four-percent sales tax on room nights. The tax will raise approximately $400,000 a year to help the city pay for bonds it issued to help restore the hotel. City manager Patrick Urich says the new income is critical. “We have 15-years of payments left on those bonds. All totaling, if you add up all the bond payments and interest payments, it’s about $44-million. So if it shutters, we’re still on the hook for having to pay bond payments. If that hotel is not operating, we’re still obligated to pay that debt back." A bridge loan from YAM Capital provides temporary funding to allow the original lenders to step aside. The deal leaves Matthews as the owner of the hotel. Councilwoman Beth Akeson voted against the plan, saying she preferred an earlier proposal that would remove Matthews as owner. But original lead lender Indure, joined by three local lenders, did not accept that deal. “Our local lenders: Southside Bank, Morton Bank, Caterpillar, have elected to join with Indure and force the city into, [what} all of you have just described as the worst deal she’s ever seen. We didn’t get our real day to persuade our local lenders the role that they would have played in this scenario,” Akeson said. The council approved the plan by a vote of 9-to-two, with Akeson and Jim Montelongo voting no. The new agreement pays off the original lenders through a bridge loan. The Pere and the adjacent Courtyard will keep the Marriott name, but a new management company will operate the hotels.